In the last 20 years there has been a great shift in how the world views Christianity. Sadly, having Christian beliefs is becoming ‘Politically Incorrect’ and will quickly cause waves if voiced. A boat at anchor doesn’t disturb the water. Only after leaving the mooring does it break the water and send out ripples. A boat makes waves when it is under full sail or powered by motor. Though the waves may disturb other vessels, the boat also creates a wake which makes sailing easier for the vessels that follow. Many Christians play it safe and don’t move forward spiritually in case they disturb the water. Instead, they float through life keeping Christianity a secret because they don’t want to rock the boat or cause a ripple. However, an anchored boat takes people nowhere – it has no purpose apart from looking nice (until it gets too old and sinks). Christianity is a voyage. When we are motivated to leave our mooring (declare to the world we are Christians) it may break friendships or even separate families. 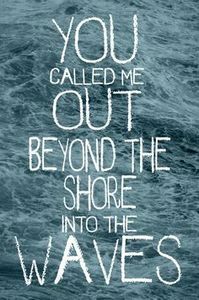 If we continue to follow Christ through the Sea-of-Life, we will make ripples. As we rev-up our spiritual life, drawing upon God’s power, we will certainly cause waves in the devil’s kingdom. (Luke 6:22-23). 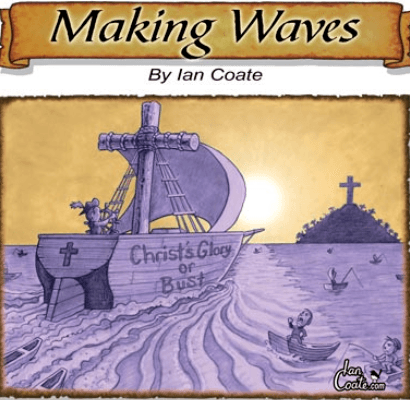 We shouldn’t deliberately ‘rock the boat’, but we can’t expect to go on a voyage without making waves. When Christ is in our sights we should never adjust our course. The waves caused by our voyage may upset some, but remember that we also cause a wake. With our course firmly set on God, we won’t know who decides to follow in our wake until we arrive at our destination (Heaven). “If the world hates you, you know that it hated Me before it hated you. If you were of the world, the world would love its own. Yet because you are not of the world, but I chose you out of the world, therefore the world hates you.” John 15: 18-19.